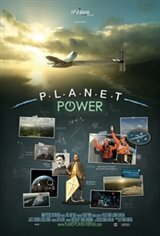 Planet Power explores the history of electricity - from the first spark created by man's hand to today's industrial power plants. We meet scientists who changed the world, like Faraday, Franklin, and Tesla and we glimpse the future, as Solar Impulse becomes the first plane to complete a round-the-world flight powered only by the sun. With a mix of chalk animation, CGI, archival footage and spectacular aerials, the film also explores the challenges ahead: how to meet the growing energy needs of our industrialized world, while also protecting the health of our planet.